With over half of the households in the UK having a garage of some kind attached to their property or within their property boundaries, you will not be alone in your requirements for garage roof materials. However, whilst garage roofs were traditionally covered with felt, bitumen or asphalt, this has changed in recent years. At Rubber4Roofs, we specialise in EPDM garage roof materials. EPDM or Ethylene propylene diene monomer rubber to give it its full name is a long-lasting and highly durable alternative to felt or bitumen. It is also very easy to install, which makes it perfect for flat roof applications. It is these attributes which make EPDM one of the best garage roof materials available. EPDM is a perfect both as a replacement garage roof material or for newly built garages. We offer two specific types of EPDM garage roof materials, these are Resitrix Self Adhesive EPDM and the ClassicBond One-Piece System. Resitrix Self Adhesive EPDM is an all-purpose, extremely durable and easy-to-install, single-ply waterproofing membrane with an EPDM surface layer. With an integral glass fibre/fleece reinforced membrane, this offers additional puncture resistance and dimensional stability. ClassicBond EPDM Is the original EPDM roofing system, with a proven track record of over 50 years service life. 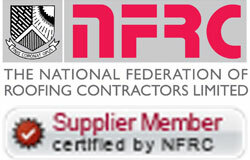 Recognised as one of the most reliable, durable and sustainable materials for your flat roof. ClassicBond is manufactured by Carlisle-Syntec, who pioneered EPDM roofing systems in the 1960s. If you intend to install EPDM rubber as a garage roof material, you will need to ensure the sub base is flat and sound. When undertaking a garage roof replacement there is often no need to remove the existing roof covering and the practice of overboarding can be undertaken. Over-boarding simply involves laying of the new roofing materials over the existing covering, without removing any of the existing material. Over-boarding is both sustainable and environmentally friendly - no skip is required and no bitumen or asphalt will end up in a landfill! This applies to both of the garage roofing material options we offer. If choosing Resitrix Self Adhesive EPDM, this can be installed directly onto the existing felt, as long as the existing roof deck is in good condition. Whilst if choosing the ClassicBond One-Piece System, the practice of over-boarding is recommended if the existing roof deck is in sound condition. With this system, it is important to use the correct length screws when installing over existing felt, as you will need to ensure the new boards are securely fastened. To order any of our garage roof materials, or any of our roofing products, simply select the product from the top menu bar and add to your online shopping basket. If you need help, please do not hesitate to call us.